Daily Math Spiral Review: Help Students Retain EVERYTHING You Teach! Since I started teaching eleven years ago, I have always given my kids morning work. Sometimes math, at other times a writing prompt, sometimes a fun little page just to get their brains working in the morning. 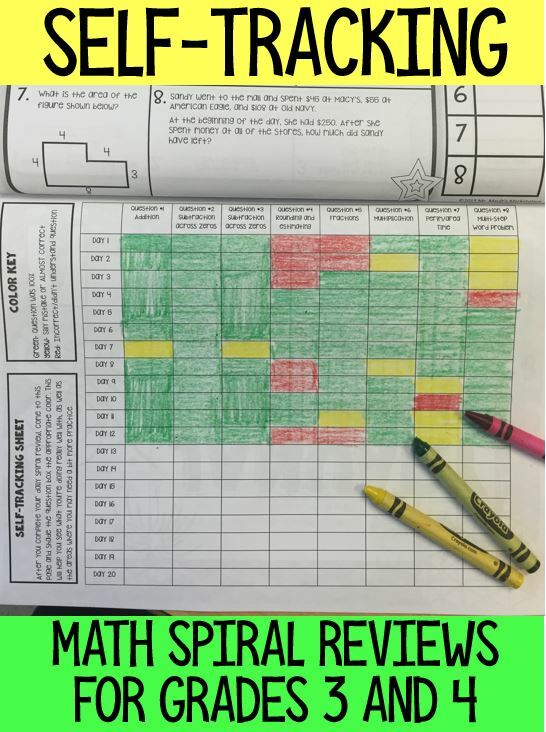 BUT, the best and most meaningful curriculum tool that I’ve brought into my classroom is the daily math spiral review. A spiral review is a daily math page that covers the topics that we have previously learned in the year. Starting at the beginning of the year, the daily page reviews some of the major math skills that were covered in the previous grade level. In the month of October, the spiral page covers material that we covered in the previous month. In May, the spirals are more in-depth and are covering almost all of the material that we have covered in third grade up to this point. We take a look at the power standards that we absolutely cannot have students forget over time, and embed these into the daily math spiral review. Now, since the time I have made these, I have created both third-grade spirals for the entire year, as well as fourth-grade spirals for the year! If they don’t use it, they will lose it. 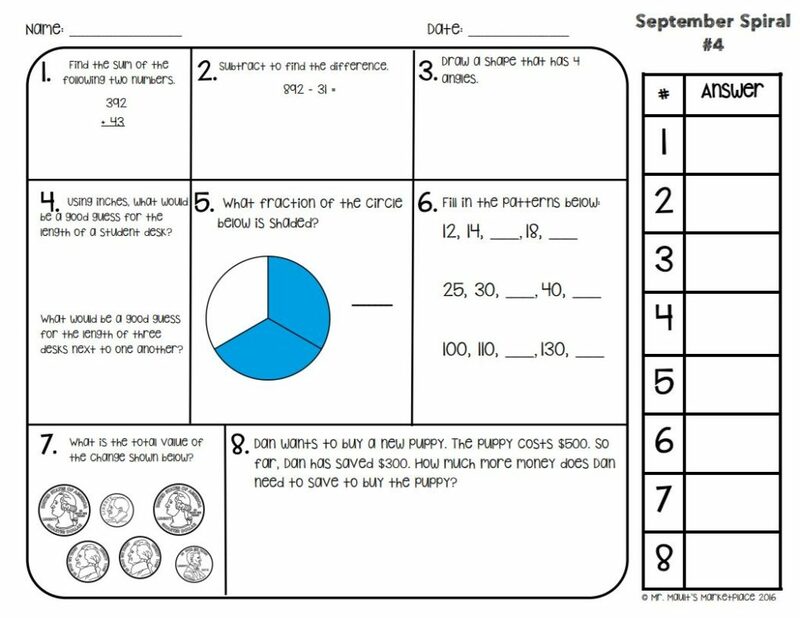 Here’s an example of a page from our September 3rd grade spiral review packet. When I say to students on a daily basis, “It’s time for spiral,” I have mixed reviews. 85% of the class is treating the spiral like a game, always trying to ensure they get all questions correct, while the other 15% of the kids groan and say, “This math is so easssssssssssssy.” In each scenario, I’m more than happy. Those kids groaning are kids who may not have mastered these standards without our daily dose of spiral. The same questions are not repeated daily, but the type of question is repeated, so kids are mastering these types of questions by the end of the month. We do change things up once in a while, too. Some days I have the kids complete the spiral independently, while other days I have them work in a group of 3-4 buddies or with a partner. What I love about working with a buddy is that they both solve the problem and they talk about what they did to solve. It’s great to hear the discussion of how they came up with a particular answer. The conversation is even better when the kids come up with two different answers, as they both go back to see where the mistake was made. These are powerful moments in learning. HERE is my favorite part of the spiral review, and from those I’ve discussed this with, this is their kids’ favorite part, as well. Data tracking!! That’s right, tracking data is their kids’ favorite part of this process! What teacher ever thought they would be able to say this with a straight face? Actually, I don’t say it with a straight face, instead I have a huge smile on my face when I say this, because I don’t have to grade the kids’ work! They do it themselves and actually get valuable data from the process. In my packets, I include a data tracking sheet (see below). I list the standard/skill at the top of each column and the day number on the left side of the page. We have a process to our corrections. The students shade the datasheet either green, yellow, or red. Green= The questions was 100% correct. Yellow= There was a very silly mistake in their answer. Red= The answer was wrong and they need some more help with this type of problem. As we are going over the spiral, the students shade each of the boxes on the data tracking sheet. The kids understand that at the end of the month, they can look at this page and see where their major errors are, and we can then see where we need to target future help. At the end of the month, on a post-it, students write the areas where they feel they need the most assistance, stick it to their data tracking sheet, and give it to me. This helps me target interventions for those kids. I have a 3rd grade bundle for the entire year that you may want to look at. The fourth grade bundle is available by clicking here! I’d love to know how you’re using spirals in the classroom! PS-I have to give a HUGE shout out to my friend, math mentor, and professional development queen, Sue Rothwell. She taught me everything I know about math spiral review, and is a huge part of why my school adopted spirals into our classrooms. Her expertise and guidance has helped our students and our teachers move mountains in the math classroom. If anyone is ever looking for a Professional Development worth your time, I highly suggest contacting Sue to work with your team and your district. I like the colors to code which are correct and incorrect. Great way to get students thinking about data. Honestly, this is the part that makes the spiral the easiest. My school is all about student-driven data, and at first I wasn’t sure how this was going to go. The kids take such ownership in this, and at the end of the month take a true pride in seeing where they have strengths, and their weaknesses. This definitely makes life a lot easier for me! I can easily look to see what the kids are falling down with. What math program do you use? We use Envisions so I wasn’t sure if each month would go along with the bundle. I actually didn’t make this to go with any one program. We use My Math, but it can be used with any program you have. Graphing and geometry are spread out throughout the year. What state standards are these matched to? I’ll be updating questions as we go to meet the slight changes that are coming with updated standards. Enter your information for a chance to win 1 of 2 $20 TpT Gift Cards each month. Thanks for signing up!